consistent high standards is our mission- which is how we maintain a strong portfolio of clients like Nestle, Parker Hannifin, Progressive, and other large corporations and employers of the region. See our project gallery for a sample of paving projects we’ve completed over the years. Every paving company is different. Ohio Paving & Construction has succeeded by emphasizing the importance of quality construction from start to finish. Below are areas of expertise which may vary widely from company to company- areas in which we excel and have mastered through decades of experience. The integrity of a commercial parking lot stems from the sub base beneath it. When Ohio Paving & Construction examines a parking lot resurfacing project, or a parking lot construction project from scratch, we bring a geotechnical engineer to examine the quality of the soil using methods including a percolation test. “Good soil” will absorb water well, moving moisture deep into the earth and reducing incidents of “moisture pockets” that will affect the surface layer of pavement, causing cracking or sagging. If there is too much clay comprising the sub base, it will be excavated and replaced with quality soil. Soil that is too soft may be recommended for “soil stabilization,” a process in which cement is mixed into the soil to create a more stable material. In some cases, geotextile fabrics will be installed. 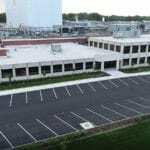 Geotextile fabrics can extend the lifespan of a parking lot by keeping the stone aggregate contained in the intended area, discouraging sinking or sagging in weaker areas of a parking lot’s subgrade. The use of a geotextile fabric is dependent on the expected amount and weight of regular traffic, as well as the quality and homogeneity of soil beneath the construction area. Once the soil is addressed, stone aggregate will be laid to create a sound structure on which the pavement can sit. This grade of stone is roughly within the size range of your standard gravel driveway (between 20mm – 63mm). 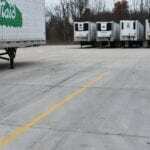 Your standard commercial parking lot will have about 6 inches of stone and 4 inches of asphalt. Your paving estimator will provide the perfect ratio of aggregate and asphalt for the strongest, longest lasting parking lot for your budget. Water is the most destructive force to your commercial asphalt parking lot, and managing it effectively is the only way to get your money’s worth out of a paving plan. Effective drainage solutions will eliminate the buildup of puddles and moisture on your parking lot and redirect it towards plant life, subterranean soil, or municipal sewage facilities. Your professional paving company will identify problem areas and ensure each area of the parking lot will properly slope into a catch basin connected to the storm water distribution system. Storm water management can be an expensive upfront cost, and an expensive recurring cost if you’re depositing water into the city system. Ohio Paving & Construction offers alternative permeable paving solutions which require little to no storm drain infrastructure, and may also make your property eligible for LEED Certification through the EPA, which can translate into tax credits or other benefits. Reach out for more details. The Americans With Disabilities Act was signed into law in 1990, and then updated in 2010. The goal of this legislation is to require businesses to accommodate the physically impaired, who may need particular parking requirements or entryway features to make an establishment as accessible as it would be for an “abled” person. 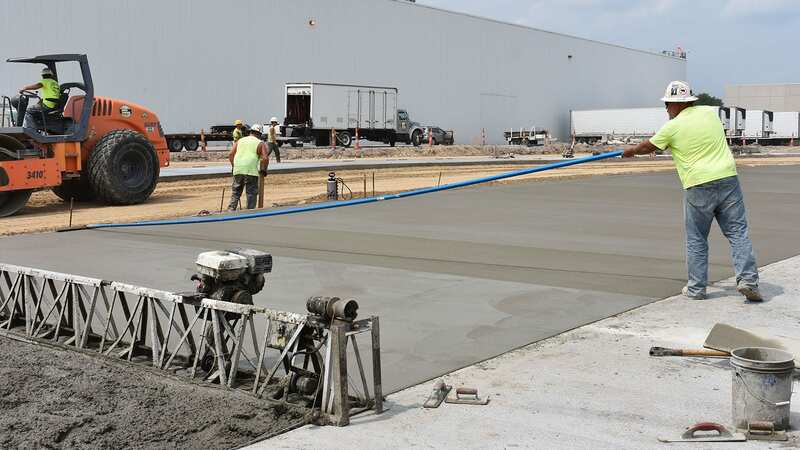 Ohio Paving & Construction‘s estimating team is comprised of experts in each facet of this legislation as it relates to your commercial parking lot, and can give you a free evaluation to identify each of the areas you might need to address in order to avoid a hefty fine. Parking lot paving costs per square foot range widely, depending on factors such as the depth of your paving project, the distance of your location from our office, the number of hours required to complete the project, the number of other services contracted on the project, as well as many other unforeseen factors. We offer general parking lot paving cost calculator on our website via price ranges. Speak with an estimator for more information about how your project may fit in your budget. One of our experts will gladly come out to your location, free of charge, and make the necessary measurements to give you an accurate quote for your asphalt or concrete paving or repair project. Our experts are also happy to make recommendations to maximize the lifespan of your parking lot, or address other issues that may cost you more money down the line. Reach out today!